Friday is the best day to visit the Marcado dos lavradores, the market of the workmen. 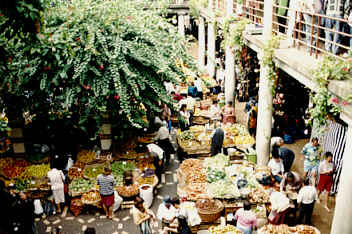 On Fridays, every farmer of Madeira comes to the market, so the market-building resembles a bee-hive. 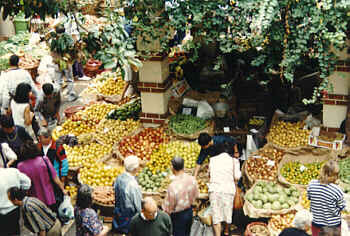 On the first and second floor you can buy flowers, fruit and vegetables. 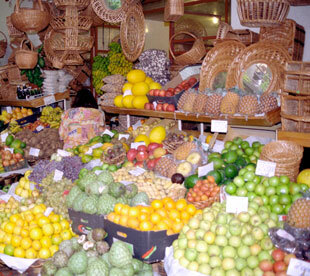 You can spend hours wondering at the strange and exotic kinds of fruit that are for sale, Onadas for example. Before buying, you can have a taste of those. The ladies selling flowers wear the traditional costume of Madeira, a red dress with a lot of colourful banners and a blue hat. 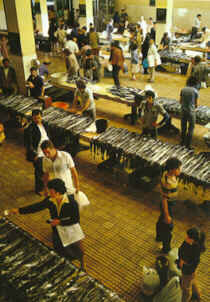 In the basement fish is sold, including the espada, a deepsea-fish and the espadarte, the swordfish. You can smell the entrance to the basement from a far. As we are not particularly fond of raw fish, we took a big curve around the stairs.